Dogwood Dell Festival of Arts 2014 Schedule! The City of Richmond has released the 2014 summer schedule for Dogwood Dell Festival of the Arts! The regular season begins on June 12, and will feature the usual July 4th Dogwood Dell festivities with fireworks and the Richmond Concert Band, “The Complete Works of Shakespeare Abridged,” Virginia Opera, and the musical 42nd Street, among many other concerts and programs. 12 Faculty Lounge Lizards, 8 p.m.
13 Sharon Rae North, 8 p.m.
15 Campbell Family band, 4 p.m.
21 Cyrus McCormick and the Reapers, 8 p.m.
22 Sunday in the Park, 2 p.m. Family entertainment and activities; Sweet Adelines, 4 p.m.
27, 28 “The Complete Works of Shakespeare Abridged”, 8:30 p.m.
29 “The Complete Works of Shakespeare Abridged”, 4 p.m.
1 Glennroy and Company, 8 p.m.
Bak N Da Day, 5:15 p.m.
Carillon Bell Concert, 7 p.m.
Richmond Concert Band, 7:30 p.m.
6 Plunky and Oneness, 8 p.m.
10 Elegba Folklore Society, 8:30 p.m.
11 David Esleck, 8 p.m.
12 English Channel, 8 p.m.
13 Gospel Festival, 4 p.m.
25, 27 Musical – “42nd Street”, 8:30 p.m.
1,2 Musical – “42nd Street”, 8:30 p.m.
8 Concert Ballet of Virginia, 8:30 p.m.
9 City Dance Theatre, 8:30 p.m.
16 Latin Jazz Festival, 3 p.m.
14, 21, 28 Storybook Saturdays, 11 a.m.
15 Applause Unlimited, 2 p.m.
25 Miss Vicki’s Gardens, 11 a.m.
29 Jonathan Austin, 2 p.m.
9 Applause Unlimited, 11 a.m.
11 Miss Vicki’s Gardens, 11 a.m.
12, 19, 26 Storybook Saturdays, 11 a.m.
16 Diggity Dudes, 11 a.m.
20 Ty-Rone Travis, 4 p.m.
27 Deborah Alsko, The Backpack Storyteller, 4 p.m.
31 Clowning Around with Shakespeare, 11 a.m.
2 Storybook Saturdays, 11 a.m.
7 Life Stage, 11 a.m.
“Dogwood Dell is a 2,400 seat amphitheatre owned and operated by the Department of Parks, Recreation & Community Facilities and located in Byrd Park. Call (804) 646-1031 for program updates and information about season performances, or log onto www.richmondgov.com/parks. Performance Postponements – Due to the brevity of many summer storms, programs are not cancelled or postponed until performance time. Please call (804) 646-DELL (646-3355) for cancellations. Dogwood Dell Festival of the Arts 2013 Schedule just got released today, without much warning that this Friday and Saturday are opening weekend! View a PDF of the brochure here. 4 Independence Day Celebration with Live Music, Cannons and Fireworks!!! Dogwood Dell is a 2,400 seat amphitheatre owned and operated by the Department of Parks, Recreation & Community Facilities and located in Byrd Park. Call (804) 646-1031 for program updates and information about season performances, or log onto www.richmondgov.com/parks. Performance Postponements – Due to the brevity of many summer storms, programs are not cancelled or postponed until performance time. Please call (804) 646-DELL (646-3355) for cancellations. Dogwood Dell Regulations: Alcoholic beverages and glass containers are prohibited. Animals are restricted unless for service purposes. Smoking and cell phone usage are restricted to areas outside the Dell seating area. Exit the park immediately following late night performances. Loitering in the amphitheater and surrounding areas is prohibited. This week you have the opportunity to catch TWO different groups performing Andrew Lloyd Webber’s hit musical Joseph and the Amazing Technicolor Dreamcoat, both FREE! And the 2012 Dogwood Dell Festival of the Arts will wrap up with Joseph on the main stage at 8:30 p.m. on July 27-29 and August 3-4! 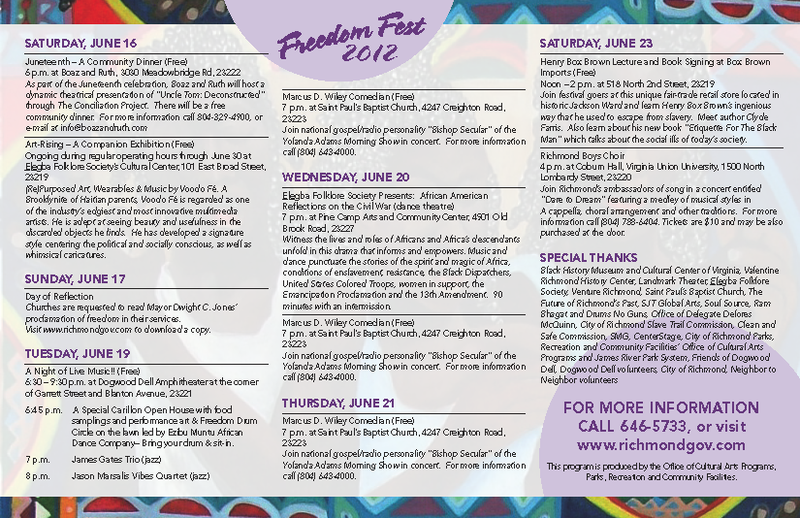 Last weekend’s Juneteenth festivities are part of the City of Richmond’s Freedom Fest, which continues this week with a Dogwood Dell concert, dance theatre performance, and free canal boat rides. 6:30 – 9:30 p.m. at Dogwood Dell Amphitheater, Garrett St. and Blanton Ave.
Join national gospel/radio personality “Bishop Secular” of the Yolanda Adams Morning Show in concert. For more information call (804) 643-4000. Witness the lives and roles of Africans and Africa’s descendants unfold in this drama that informs and empowers. Music and dance punctuate the stories of the spirit and magic of Africa, conditions of enslavement, resistance, the Black Dispatchers, United States Colored Troops, women in support, the Emancipation Proclamation and the 13th Amendment. Ninety minutes with an intermission. The schedule for Dogwood Dell’s 56th Festival of the Arts has been posted! Please stop by the Carillon Terrace to enjoy some pre-show entertainment and browse photos of the World War I Memorial Carillon, built as a tribute to those veterans who served in The Great War. Dogwood Dell is a 2,400 seat amphitheatre owned and operated by the Department of Parks, Recreation & Community Facilities and located in Byrd Park. Call (804) 646-1031 for program updates and information about season performances, or log onto www.richmondgov.com/parks. Due to brevity of many summer storms, programs are not cancelled or postponed until performance time. Please call (804) 646-DELL (646-3355) for cancellations. Alcoholic beverages and glass containers are prohibited in city parks. Animals are not permitted at Dogwood Dell. Regulations are enforced. Out of consideration for others, audience members are asked to confine smoking and cell phone usage to areas outside the Dell seating area. Audiences are requested to leave the park immediately following the late evening performances. The full 2012 schedule will be released shortly, but the Richmond Department of Parks, Recreation and Community Facilities announced that the musical Joseph and the Amazing Technicolor Dreamcoat will conclude the 56th annual Festival of Arts at Dogwood Dell, with free performances on July 27 – 29, and August 3 and 4. Director/choreographer Leslie Owens-Harrington and Musical Director Ben Miller seek approximately 18 men and women, ages 17 and up, to fill a variety of roles. Please prepare 16 – 32 bars of a song (musical theatre style preferred) and be prepared to move. Accompanist will be provided. No performers paid. For more information please call Barbara Brock at 646-1031, or e-mail Barbara.Brock@richmondgov.com.